Measure around your upper arm in two places: just below the armpit and just above the elbow. Use your off-arm (the one that you don't use to write with) for ease of drawing the wand. Take your two measurements and add about an inch (2.5 cm) to them. Cut two pieces of elastic to the lengths you've determined. Find the middle of each strip and lay your wand across it. Pinch the elasic tight around the wand (one at each end). The “wand” the author used in her pictures is just a plain dowel rod, which is the same thickness at both ends, but your wand may be tapered. With a needle and thread, sew the elastic to create a loop that holds your wand securely. Don't make it too tight, since you want to be able to slide it in and out easily. In the same way, don't make the loops too loose, lest your wand side out of your sleeve during dinner. Now comes the tricky part. You may need an assistant for part of this. Wrap the elastic strips around your arm, holding them snug. Overlapping the ends, sew the strips into two circles. They should be a little tight to prevent sliding, but not so tight as to cut off your circulation. Once you have the loops on your arm, you may need to practice sliding your wand in and out, especially once you have your robes covering it. Using a tapered, pointed wand will probably be the easiest to sheathe, since it can be tricky to aim for the loops under fabric. This holder was mostly designed to be worn by a woman, who might have robes too formal for any kind of pockets. 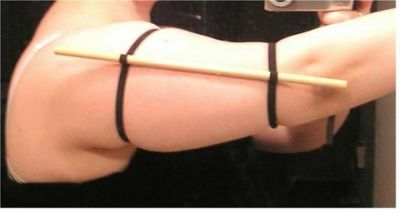 You could also make the elastic loops slightly smaller and wear the holder around your forearm. Theoretically, it could also be used to hold a wand to your lower leg, similar to having a knife in your boot. © Helene of Troy's tutorial was taken with permission from HarryPotterCrafts.